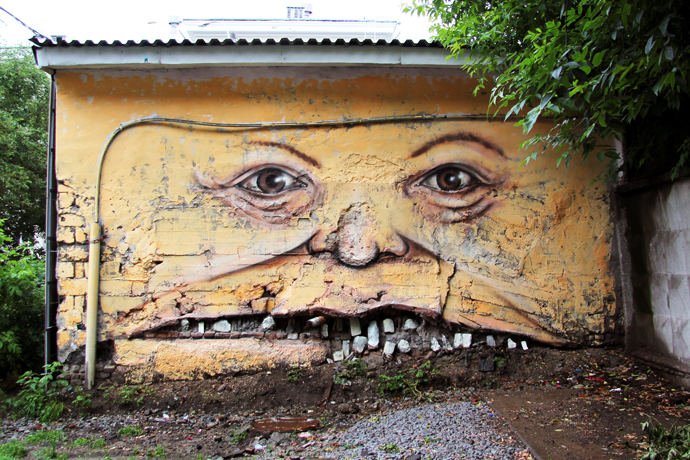 Dilapidated buildings and ramshackle structures in Russia and beyond are now wearing expressive faces, thanks to a talented young Russian artist. Comical looks and scary expressions breathe life and humor into what was once urban decay and desolation. 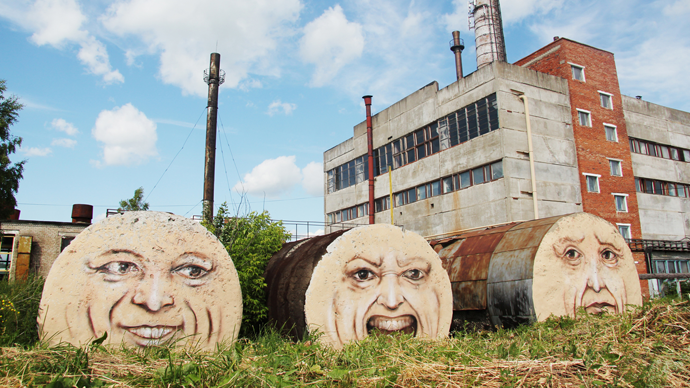 A Russian artist, Nikita Nomerz, launched the project dubbed “The living walls” in Nizhny Novgorod in 2010. Nikita transforms the facades of disused and dilapidated buildings into characters with human emotions: happiness, embarrassment and even anger. City wasteland, trees and even bridges also come in for the magic treatment. “It wanted to create a series of street works, which have a common idea of giving a second life to old, abandoned buildings,” writes Nikita on his official website page. A scruffy water tower becomes a beacon of laughter and a bridge across a river assumes the aspect of a scary monster with sharp teeth, thanks to Nikita’s deft touch. But Nikita didn’t stop with the “Living walls” project in Nizhny Novgorod. 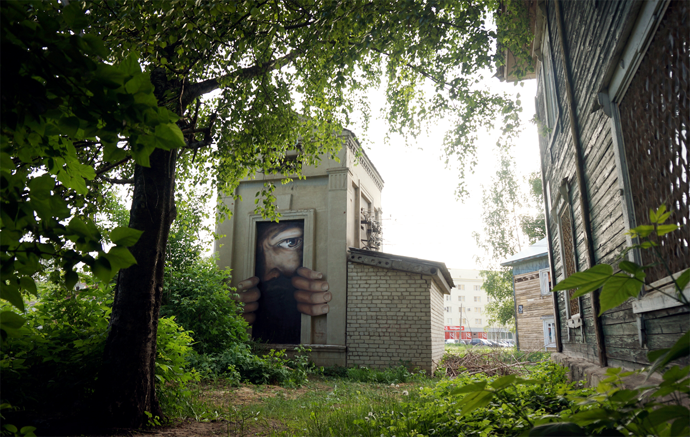 He was invited to breathe life into rundown buildings and other structures in Moscow, Ekaterinburg and Perm. 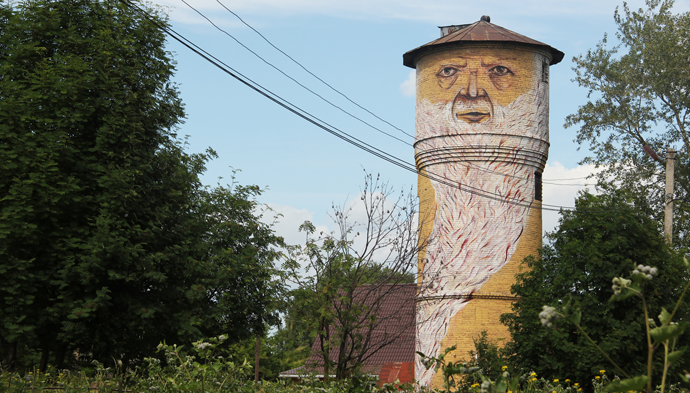 Belarus also took a shine to the gifted artist, whose art now adorns buildings in Minsk and other cities in the country. In 2013, Chinese Hainan Airlines’ official magazine published a piece on the talented artist in an article called: "The Smiling Crumbing Walls". After this publicity, Nikita was invited to Suyfunhe City in China where he brightened up the façade of a four-story building with a stunning piece of work called “The Chinese residents”.